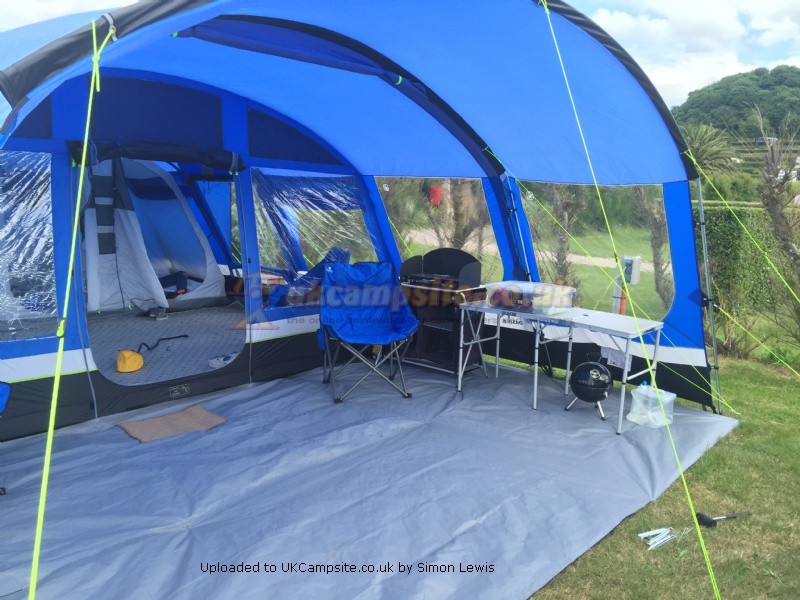 Purchased this tent as the 4 berth we had wasn�t really big enough. Brought this from Go Outdoors in a sale. - Forget trying to put it back in it�s bag! 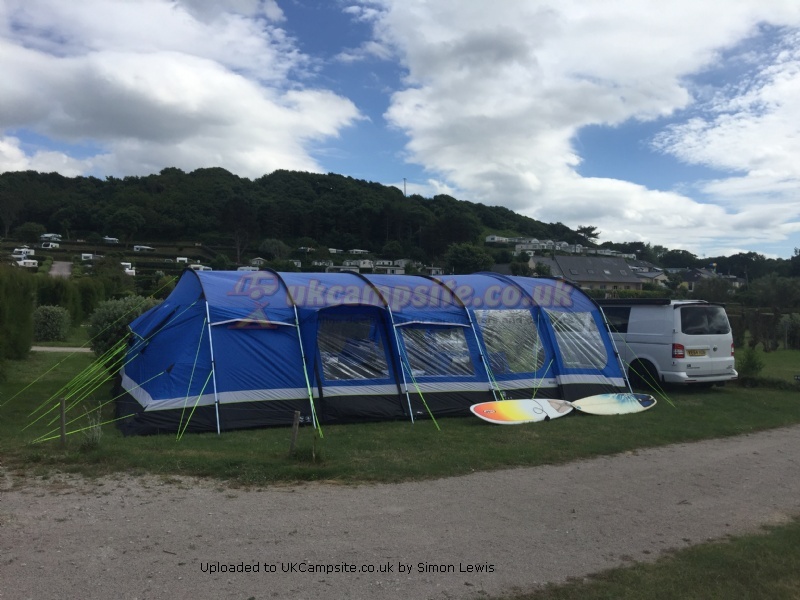 For us with two adults, two kids, two dogs plus all paraphernalia, it�s really worth it for a week+ camping. For shorter stays it�s quite a lot of effort to put up. 2. We have had a couple of little tears develop; They have been patched with the kits provided, but it�s a little fragile and I suspect these may have happened either when drying or putting up/taking down The fabric is a little more fragile than I hoped. Generally a very good tent, I�d throughly recommend for the money. Yes a few cons, but when camping for a week+ you need some space. We upgraded to this tent from a Kalahari 8 after researching what kind of tent would suit us the most, being as we now holiday exclusively by camping. This tent definitely is a luxury! It has stood up to bad weather, both rain and wind, but is also fairly easy to keep aired in the hot weather, too. It has lots of windows so very light and airy in the daytime, but all the windows and doors have 'curtains' for privacy and at night. Definitely a talking-point with other campers and caravanners too! Fairly easy to erect once you get used to it, it is very heavy though due to the size of it and the steel poles. We're an (older) family of four so we manage just about fine. The built-in porch is very handy for cooking/eating under, and also when it's raining you can still take your wet shoes/wellies off before you go inside the tent, without getting drenched even more! The main living area is huge, plenty of room for all of the family to do their different hobbies. The bedroom pods are the perfect size too, even with our raised airbeds there's plenty of room for our luggage, etc, at the side. A couple of things we'd recommend is to have a good heater that can warm up such a large space, and also to make sure you have enough lighting, as if one person is with the lamp at one end, the person on the other side doesn't have any light because it's so far away! We definitely recommend this tent, it's perfect for our family holidays. Ideal for young or older families alike, or friends camping together in a group. Having made our early camping adventures in a Rock 4 to see if we liked camping and finding we did, we decided to move up to something bigger and less cramped.We plumped for the oasis 8 as we sometimes take our grandchildren, or if we go with other family members it can be used as the main social area. The price might appear daunting but you are buying a virtual bungalow. We had our first week away at the start of June and struggled at first to erect the tent. We were aware of the need to get air into the tent prior to erection but clearly didn't have sufficient to release the vacuum. Once that was sorted it was easy to put up between my wife and I despite us both having physical disabilities. We were both very impressed, but the 10 rating we have given it wasn't given lightly. On the second evening of our holiday we returned to the tent in torrential rain and gale force winds of around 40 mph gusting to 60 mph. The tent remained solid with no damage or water ingress.We couldn't praise it highly enough. We haven't yet fitted the awning and we did have a problem with one of the bedroom fasteners that came detatched when one of the girls tripped and pulled on the bedroom compartment, however, Go Outdoors have repaired it with no quibble or fuss. It is huge, airy, 3 bedroomed, great in all weather. It has stood up to torrential rain & high winds and not batted an eyelid. I love the built in porch where we set our cooker up under shelter. Big rooms that you can stand up in easily. The first time we used it we shut all the ventilation vents and it poured down (so got warm in the tent) & condensation came down the window cover ties and wet the floor. I don't class this as a err on the tents part but more of ours being novice campers! It is very heavy and takes a lot of room up in our car and takes 2 people to erect. Having looked at loads of tents before buying this, this was by far my favourite. The living space is huge. I love the fact you can uncover big windows around the whole living or shut yourselves away at night. We upgraded from our Zenobia 6 to the Oasis 8. This was the best upgrade ever. We were typically happy with our previous tent but decided we needed more room for longer stay holidays and the Oasis 8 had everything we wanted. There is plenty of room for us to move around. We bought the package which included the footprint, carpet and canopy which was a godsend as we are able to put a windbreak up across the from and had even more storage and room to cook. It was simple to put up but it did take two people to put up and take down. It is heavy but we camped out in high winds and heavy rain and it stood to test. We recently bought this tent as an upgrade from a Mojave 5 as we are looking to go to France camping next year. We took it for a test run for a weekend break in July, boy was it put through the mill, we had thunder storms, torrential rain and winds, it stood upto it all. We did struggle to erect it, as its a heavy tent. It comes in two bags both of which are heavy so beware. It's a very large tent once up with more than enough space for all needs. I would definitely recommend this tent to anyone looking for a little more than the usual. Overall the Oasis 8 is great value for money. Add your review of the Oasis 8 Elite! The Hi Gear Oasis 8 Elite (previously known as Premium) is a very large multi-roomed tent with spacious removeable bedrooms, a massive living and storage area, large panoramic windows and easy access in or out from the large front door and hooded side entrance. It's easily pitched if you have a helper, and the strong steel poles keep it stable and rigid even in stormy conditions. Large panoramic windows with roll up curtains and mesh venting, let plenty of light in and give you a great view out, and they can be closed at night or in poor weather. The versatile multiple bedrooms can be removed to give you extra living or storage space, making the Oasis Elite 8 ideal as a base tent for an outdoor event as well as for your family holiday.